Melanorosaurus was a herbivore (plant-eater) that lived in South Africa during the Triassic period, about 227 to 221 million years ago. It was once considered to have been a Prosauropod, but is today widely considered to be one of the earliest Sauropod dinosaurs. Melanorosaurus was about to 39 feet (12 meters) long. The first fossil specimen was found on the North slope of Thaba 'Nyama (Black Mountain) in Transkei, South Africa. The creature's name means "Black Mountain Lizard". African Dinosaurs - Melanorosaurus lived in South Africa. Melanosaurus was a genus of dinosaur. "Melanorosaurus" means "Black Mountain lizard" (after a mountain in South Africa). Melanosaurus was a member of the Saurischia ("lizard-hipped") order of dinosaurs. What this means, is that although Melanosaurus was not closely related to lizards, it did have similarly shaped pelvic bones. Melanosaurus was a Sauropod - a member of a group of related large quadrupedal herbivorous (plant-eating) dinosaur with long necks. Melanorosaurus lived between about 227 million years ago and 221 million years ago, during the Triassic period. 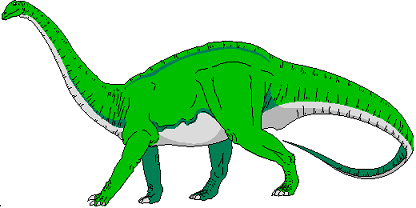 Melanorosaurus was a herbivore (plant-eater). Melanorosaurus was about 39 feet (12 meters) long. Melanorosaurus weighed about 1.3 tons. Set Includes: twin set includes 1 comforter, 1 standard sham, 2 decorative pillows. Full/queen set includes 1 comforter, 2 standard shams, 2 decorative pillows.